CONTEST: Win a Roxette stamp booklet! Santa thought it’s nice to surprise you all with a little retro contest. 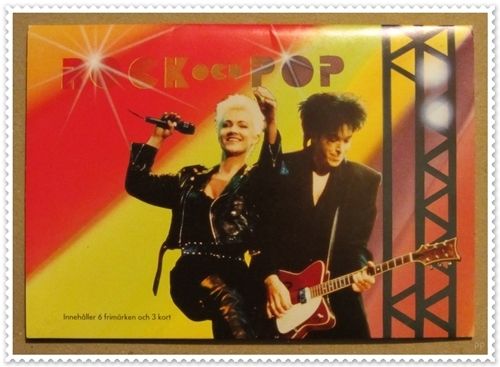 You surely remember that 25 years ago Roxette was honored by being featured on a Swedish stamp. The “Rock och Pop” theme stamp was released by the Swedish Post on 5th October 1991 in 3.6 million copies (source: a Swedish stamp site). We’re not even dead. We thought it was a joke at first. I know ABBA was a stamp in 1982, but it’s not something that happens every day. It’s nice to have the entire Swedish nation licking your back. That was a kick, of course. It was almost like being knighted, I guess. I have used them a lot. I used to send cassettes to my record company with them. They can’t refuse the music that way. The stamp was also released in a special booklet featuring Roxette on the cover and including 6 stamps (2 Roxette, 2 Lena Philipsson, 2 Jerry Williams) and 3 postcards (1 Roxette, 1 Lena Philipsson, 1 Jerry Williams). Send an e-mail with your name, address (so we can send the booklet in case you win) and the correct answers to the questions to rxbcontests@gmail.com until 23:59 CET, 21st December 2016. The lucky winners will be announced a few days later. Good luck! – In order to participate, you have to send an e-mail to rxbcontests@gmail.com with name, address and correct answers to the 3 questions. We will consider all e-mails we receive until 23:59 CET on 21st December 2016. Update on 22nd December 2016: The 3 winners are: Lana Sachse, Yonita Marto and Travis Wilhelm. They were notified via e-mail.